The single project that I am most excited about each year is the Intermountain Bird Observatory’s on-going research into the unusual ecology of the Northern Goshawk (Accipiter gentilis) population within the northern Great Basin. This population was the focus of my master’s thesis and I have had the opportunity to continue to lead the research in this area. This is my favorite project as I lead it end to end (design, implementation, analysis, reporting) and most importantly, it involves goshawks, which are just cool birds! The project is focused on the Minidoka Ranger District of the Sawtooth National Forest. This district is located south of the Snake River, far away from the much better known northern districts near the Sawtooth Mountains. 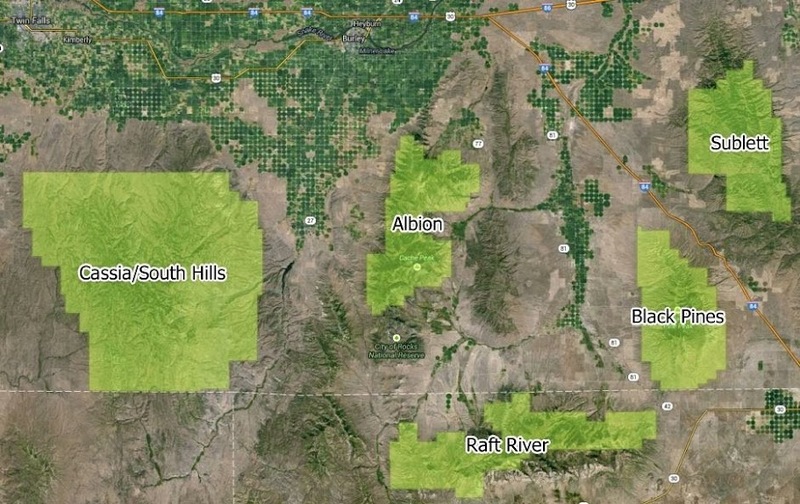 My thesis focused on the South Hills section within the Minidoka District, but I have applied the results of that work to the other sections both last year and this. 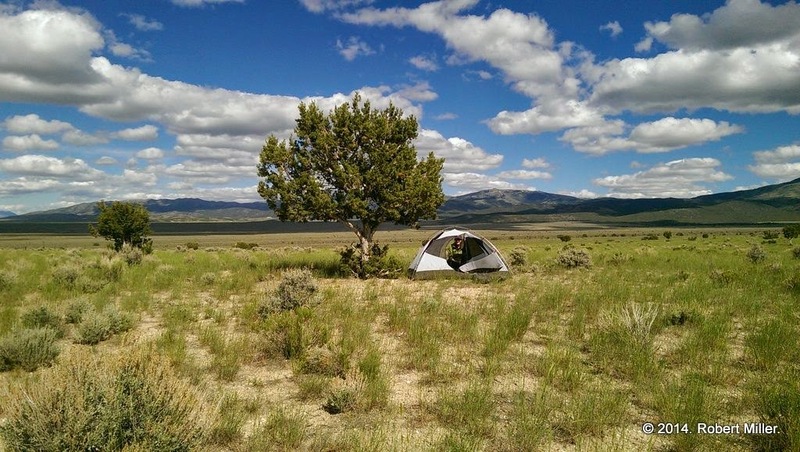 Minidoka Ranger District of Sawtooth National Forest, southern Idaho and northern Utah. Last year I utilized the habitat suitability model I developed in the South Hills, to locate suitable habitat in the Sublett and Black Pine Mountains. This resulted in a number of newly discovered breeding areas for goshawks within the forest, helping forest managers better manage the landscape. This year I was asked to apply the model to the Albion and Raft River range. We have just completed nine days of work surveying these areas with great results! Over the coming week we will continue surveying the area for breeding locations of the Northern Goshawk. The most exciting part of this year’s project is the addition of genetic analysis to determine the levels of inbreeding depression that may be occurring within the South Hills population (and other northern Great Basin populations) of goshawks and the level of genetic exchange with other populations along the Pacific Coast and the Rocky Mountains. Previous research has shown little mixing between the Rocky Mountains and Pacific Coast goshawk populations (Bayard De Volo et al. 2013), but they did not include Great Basin populations of birds. Boise State University has received a National Science Foundation grant to fund undergraduate research (REU - Research Experiences for Undergraduates). This grant funds the research of eight undergraduate students from across the country and is focused on raptor research (BSU has at least two other REU programs as well). The Intermountain Bird Observatory has been assigned one of these students, who has joined me in the field performing surveys and will lead the genetic analysis of the results. The Intermountain Bird Observatory’s REU student for 2014 is Steph Szarmach. I have had the pleasure of training Steph and working with her over the past nine days. She has dealt with long days, difficult terrain, hot/cold/wet weather, and with me as her mentor! She has been a tremendous asset to the team, finding her first new goshawk territory, hiking solo, on only her third day in the field. Awesome. Welcome Steph! Steph on her first day in the field! Albion Mountains, Idaho. Steph setting up her tent with the Raft River Mountains in the background, northern Utah. We have performed survey work in the four eastern sections of the Minidoka Ranger District so far. We have discovered seven previously unknown breeding territories so far, which far exceeds our expectations. This speaks to the strength of my modeling efforts, the focus and attention of the team, and on more than a little bit of luck (more on that later). We hope to discover even more before we are finished. As I have mentioned, the genetic analysis of the South Hills (and other Great Basin) populations of goshawks is an important part of this project. In 2012, Team Goshawk collected blood samples from goshawk nestlings within the South Hills for the purpose of researching blood parasite levels. The results of that work is currently in review at the Journal of Raptor Research (Jeffries et al. In Review). We preserved those blood samples for genetic analysis and Steph has begun that work in the lab. DNA extraction of 18 goshawk nestling blood samples from 2012. We expect to augment the 2012 samples with new samples from 2014. This process has already begun with the first two samples collected! Rob (me) climbing nest tree to gather DNA samples from two nestlings. Climbing into raptor nests requires a great deal of training and bird experience in general. No two trees are the same and decisions must be made during the climbing process to maintain the safety of the birds and the research team. This perspective and ability to make decisions in based on practice and experience. As a part of the REU program, I along with Dr. David Anderson, City of Boise arborists and Boise State University arborists, led a tree climbing clinic for all eight REU students. This clinic provided general experience, but did not fully prepare students to climb into occupied nests. During the late afternoons and evenings in the field, after surveying, I have worked with Steph to further train her to climb into goshawks nests. She is performing well and is making progress toward that end. I expect that she will be climbing into some of the nests we will sample in the nest two weeks. Wow, I wish I had this type of experience when I was an undergraduate! Steph climbing trees in the Albion Mountains. Steph 30’ up the tree, training for goshawk nest access. Anyone for 60’? There are some things I observe in the field that make me physically sick. Human carelessness, ignorance and indifference which result in harm to wildlife is one of those factors. Unfortunately. this last week I experienced this utter disgust, but luckily we were there to do something about it (at least for some birds…). Steph and I were checking the status of a previously known goshawk breeding area. Within one area is a water tank which captures the water from the spring for later use by cattle and sheep grazing. I noticed the tank was un-capped and remembered reports of drownings from other researchers. My intuition told me to check. I was sickened by the result. Un-capped water tank, Sublett Mountains. One of three dead birds in water tank. There were three dead birds and one live goshawk in the tank. The goshawk was perched on the ladder in the tank, but was unable to get out, with the steep tank walls. This male goshawk had a occupied nest nearby with nestlings waiting for food. Even a half day without food can negatively influence the lifetime reproductive success of a raptor. We hoped he had not been in there long. Adult male goshawk stuck in water tank. Steph and I carried a log to place in the tank and put the end near the goshawk on the ladder. We checked back two hours later and the bird had escaped. It was a simple solution that should have been there to begin with. We have notified the authorities requesting that the situation be permanently resolved. I will be back by there in a few weeks to see if any permanent solution has been installed. I will also check to see if the nearby goshawk nestlings are still doing well. Water tank with log “ladder” installed! Goshawk still in view on lowest rung of permanent ladder. Many biologists deal with models to predict habitat associations of animals. One chapter of my thesis was focused on identifying the habitat suitability of goshawks in the South Hills. As I mentioned earlier, I have applied that model to the other sections of the Minidoka Ranger District to prioritize areas for surveying. In the last three years this has resulted in the identification of sixteen previously unknown breeding locations for the species. This is far above our previous expectations. In fact, the model has a near 75% success rate in identifying suitable areas. In the Raft River Mountains we were three for three in identifying new territories! While models are helpful in focusing our efforts, they are just models. By definition, all models are wrong. Models use just a handful of habitat variables to predict suitable habitat. It would be impossible to include all of the possible combinations of factors influencing territory choice, especially realizing that there is variability on preferences among individual birds. Regardless, in general, the process works. Models are also dependent upon the habitat being sampled. As my model was developed in the South Hills, it is most effective in selection among Aspen, Lodgepole Pine, Douglas Fir, and Sub-alpine Fir. Particularly, the model is effective at eliminating Sub-alpine Fir as this substrate lacks suitable structure to support nests (although it is still used on occasion…). Thus, I was surprised to arrive at one of my survey sites to find only Piñon Pine and Juniper. The slope, aspect, elevation, and ruggedness were all optimal for goshawk occupancy, but I had doubts about the forest substrate. Apparently the right mix of Piñon Pine and Juniper present a “signature” to the imaging satellite which resembles Lodgepole Pine. Thus, this location was selected by accident. I was not very optimistic, but we had travelled far to get here and would continue with our surveys. The night before our survey, Steph and I observed a male goshawk hunting near our camp. We spooked it up as it was on the ground just a couple feet away from two Mourning Doves. While we were sad to have interfered with his hunt, I was amazed he was there. The next day we located the nest in Piñon Pine. The pair had two healthy and fairly old nestlings (relative to other nestlings we had observed). So, the model can get it wrong and we still find nests! Steph will not believe me that goshawks are rare. She has seen a goshawk every day but one during our nine days of surveys. We have watched goshawks hunting from our camp on three of eight evenings. Driving out of the mountains on our final day of this bout, a goshawk with a ground squirrel flew right in front of us! It does seem like a good year for goshawks! Goshawk nest in Piñon Pine tree with two 22 - 24 day old nestlings. It’s not all about goshawks. Actually, it is, but we do see other nature as well. Deer, Elk, Moose, Marmots, and lots of birds. Anytime we are in the field, we observe other nature doing it’s thing. This last week I happened across other birds nesting in the forest including Red-tailed Hawks, Common Ravens, and a number of songbirds. Warbling Vireo nesting near our camp, Albion Mountains. that I observed this week. Albion Mountains. After four days of rest and resupply, Steph and I will head back out into the field. We will return to the Albion Mountains for a few more days of surveying before we shift over to genetic sampling. We will sample blood from nestlings located within trees we can safely climb and trap adults from nests where we cannot safely access the nestlings. Steph has a deadline of the end of July to complete her genetic analysis and present the results at a local conference. We have jointly received a NSF travel grant to attend the Raptor Research Foundation annual conference in Texas this September so that Steph may present her results to an international audience of raptor experts. Thank you for documenting the livestock water trough hazards. And the presence of the goshawk nest in pinyon.